As I pursue my PhD in physics education research, I have found time to explore a number of interesting questions. 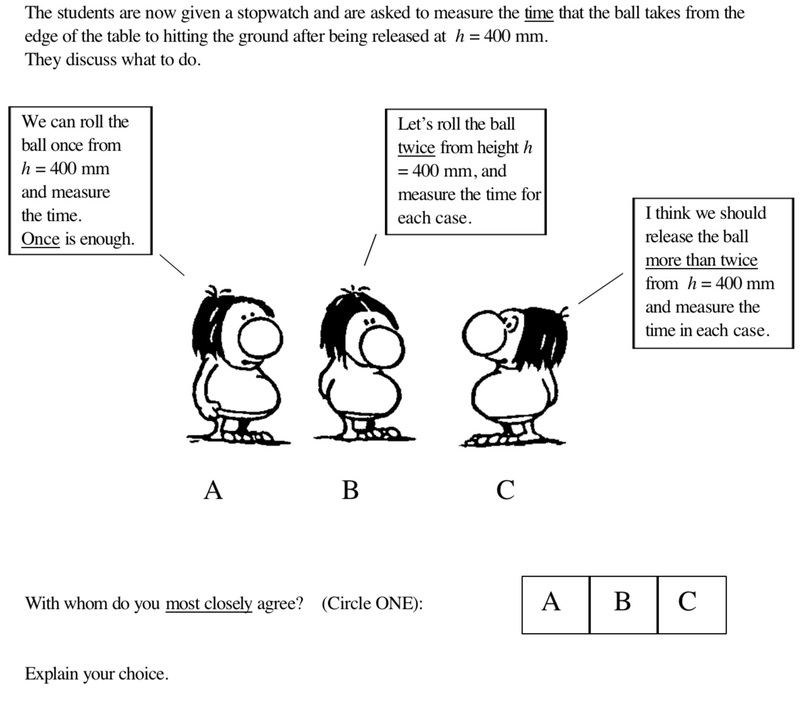 In this post, I’ll explore an approach to thinking about student reasoning in the introductory physics lab that we decided not to pursue at this time. These axioms feel true and, as a teacher, I see value in getting my students to understand fundamentals about the nature of scientific work. However, while they are broadly applicable, the reality of science is that none of these axioms are exactly true. There is the question of whether science has a universal “method” — Paul Feyerabend argues it doesn’t. When I sat down with a distinguished professor to look at the PMQ, the professor could identify the “right” answer, but often didn’t agree with it. So maybe attempting to define how science works isn’t a productive approach. Fortunately, the PMQ isn’t just a test of whether students agree with certain axioms of experimental physics. After “Explain your choice”, the PMQ includes several blank lines for the student response. The instructions suggest that students should spend “between 5 and 10 minutes to answer each question”. Alternatively, we could view the point-like paradigm as that in which students don’t account for measurement uncertainty or random error. Thus, it is possible to conduct a pre/post analysis on a lab course to see whether students’ reasoning shifts from point-like to set-like over the course. For example, Lewandowski et al at UC Boulder have done exactly this, and see small but significant shifts. I subjected a class of 20 students to the PMQ, and coded the responses to two of the prompts using Volkwyn’s scheme. The categorization was fairly straightforward and unambiguous. For question 5, which asks students which of two sets of data is better (one has larger spread than the other), 17 students provided a set-like response and 3 gave the point-like response. For question 6, which asks students whether two results agree (they have similar averages and comparatively-large spreads), only 1 student gave a correct set-like response, and the other 19 provided point-like reasoning. Different types of prompts may have very different response levels. Similar results are found in the literature, such as Lewandowski’s paper, above. This suggests that the set-like reasoning construct is complex, either with multiple steps to mastery or with multiple facets. Thus, it might not make sense to talk about it as a single entity with multiple probes, but rather as a collection of beliefs, skills and understandings. Some of the reasoning on question 6 seemed shallow. This suggests, for me, a bigger take-away message: my students aren’t being provoked to think critically about their data collection and analysis. How much data should I collect? What range of data should I collect? How will I represent the results of my data collection? How will I parameterize the spread in my data, and how will I reduce measurement uncertainties and random error? For different types of data, how can we know if two results agree? Interestingly, some of Natasha Holmes’ work on introductory labs starts with the 5th question by asking students to develop a modified t-test, and then uses that tool to motivate cycles of reflection in the lab. That’s another approach we’ve agreed doesn’t quite work for us, but that is likewise a huge source of inspiration. This entry was posted in Uncategorized and tagged labs, physics, PMQ, scientific reasoning on November 10, 2018 by Danny. This is a quick note about something I keep encountering in practice, but haven’t seen described in The Literature. If you have an references, please send them my way! I think it's important to have gender equality or neutrality to avoid leaving girls feeling excluded, even subconsciously. Performance is more subtle – small changes in wording can make big changes in performance gaps. Girls are put off by answers that sound unscientific. Summer C emphasizes that gender isn’t a 50/50 split, and that assuming a binary nature of gender is problematic, including for students who aren’t cisgender. Anything to promote inclusion of ALL students. It means so much to them to be validated in our classrooms. When I'm writing TIPER-style problems, the people involved are usually named Jay, Kay, and El. Em sometimes stops by. @TeachFORSCIENCE and I were just talking about using Zis/Zheir pronouns on documents which would be the next step. I read somewhere (and of course I can't find it now), that problems should use "you" as the person. (E.g., "You are pushing a box.") The thinking is that students relate to it better when worded that way. Unintended consequence is avoiding gender/cultural bias. This discussion was enlightening for me — thanks to those who contributed! I’ve been slowly putting together some ideas around the idea of “latent colonialism” in physics, the idea that a large portion of the canon of physics culture is a remnant of the colonial era and thus carries some problematic attributes with it. For example, textbooks around the world feature the same group of ~20 physicists (Newton, Franklin, Ampere, Maxwell, Einstein, etc) — all white, male, and Western European. Or consider that the names of the famous physics equations and principles, although developed over a couple millennia, have Western European names. This has been shown to negatively impact students who aren’t white and male. Seek Neutrality. Simply remove the names from the canon. Instead of Snell’s Law, we would call it the Law of Refraction. This approach has been adopted in several curricula, but I see two problems with it: first, instead of giving an advantage to white boys, the curriculum gives an advantage to no-one; and second, culture is complicated and it’s not clear we’d be successful at expunging all the biased artifacts. Instead, we could seek out cases in which white women and people of colour contributed to the history of science and highlight them as well. This would aim to present a canon that is representationally Equal. I’m currently reading up on Émilie du Châtelet, for example. This would allow us to re-cast the history of physics as an endeavour that involved white men and women in Western Europe, and built on the mathematics and early work done in the Middle East, and to a lesser extent India and China. Putting aside the cries of “revisionist history”, this isn’t clearly going fix everything, either. For one thing, the truth is that a lot of contemporary physics knowledge, in the form in which we currently teach it, was assembled by white men who refused to allow white women or people of colour in on the proceedings (with some rare exceptions). Which bring us to the Responsive approach, which is to acknowledge the deliberate exclusion, intellectual theft and, well, colonialism that took place during the construction of the set of ideas we think of today as the canon of physics knowledge. This would be hard: it would involve physics teachers talking about history and racism in their classes. Likely, the best response is to do all of these, in the contexts in which they work best, to the best of our abilities. For example, I taught for some time in a country in which it was constitutionally prohibited for schoolteachers to talk about gay marriage or other gay rights issues in their classes: that type of thing severely restricted my ability to talk with students about some of these issues. It is my hope that this classification is useful in deciding which response to take. This entry was posted in Uncategorized on June 3, 2018 by Danny. Some of my research these days is focusing on the introductory physics lab. In this post, I will seek to outline some qualitative findings about introductory physics labs at universities and colleges in the USA. I am planning to follow-up these conclusions by doing a survey of a representative sample of physics departments — but that will have to wait until late August. In most programs, the physics lab runs parallel with the physics course. At Lincoln University, for example, students take Phys 105 and 106 as their two-semester introductory physics sequence, and also enroll in Phys 105L and 106L at the same times. Here, the goal of the lab tends to be focused on reinforcing core ideas. At Penn State, labs “are designed to provide you with hands on experience with the material being investigated in class”. The key concern here is that recent research suggests that labs provide “no added value to learning course content” (Holmes et al). Less common is a lab that is run as a separate course, sometimes requiring the first course in the introductory physics sequence as a pre-requisite. At Drexel, for example, students take Phys 128 as a separate course. These separate courses tend to focus more on the development of experimental skills and mindsets. At Carnegie Mellon, the purpose of intro lab course 33-104 is “to become skilled at acquiring, recording, and analyzing data, and drawing conclusions from experimental work”. 2. What is the purpose of labs, anyway? The AAPT lab guidelines focus on the process of “constructing knowledge” and scientific skills, rather than core ideas. Ideally, I think, labs would meet both aims: helping students to enrich their understanding of core physics ideas, while also learning how scientific knowledge is generated experimentally. In constructing a lab experience, core ideas and scientific skills will need to be interwoven. Could we say that a lab is successful if students only practice core ideas? Could we say it is successful if students only learn scientific skills? I would say that the former is not acceptable, but the latter might be. 3. What labs are being done? Cookbook-style lab manuals are nearly ubiquitous. Most of these seem to have been written locally, but have the same format: an overview of the relevant physics (which students rarely read), then step-by-step instructions for what students should do in the lab, and finally some questions. There is variation in how students are assessed. Often, there is a pre-lab quiz. Written lab reports are common (often 1 per group of 1-3 students), as are worksheets that need to be filled in. Most labs are 3-hour sessions, with a new experiment each week. In some places, a 1-hour lecture precedes the lab session. In others, experiments stretch over two weeks. Some manuals seem to try to scaffold students from this mode of highly-structured inquiry (where direct instructions are given) toward guided inquiry (where, instead, students are given goals and broad guidance). I wasn’t able to find any lab programs that aim for open inquiry. 4. How do AP, IB, and Cambridge A-Level lab expectations compare? For all three of these programs, labs are expected to occupy about 20% of the instructional time. In the AP, IB and A-Level classes, labs are explicitly expected to build toward independent student work (ie: open inquiry). AP labwork is not assessed directly, while IB students submit a lab report for external assessment, and A-Level exams include a substantial practical component. It seems to me that colleges and universities have substantially lower expectations for student performance in labs than is found in the AP, IB, and Cambridge A-Level courses. This entry was posted in Uncategorized on May 20, 2018 by Danny. I’m proud of my successes as a STEM teacher working toward equity, but I’ve also had failures. In order to get better, I need to understand, and correct for, those times when I’ve made mistakes. Here are some examples I’m thinking about now. I met Irina when she was in 10th grade because she was doing a project in physics and wanted to talk with the school’s physics teacher about it. I knew that she was interested in technology and science in such a way that engineering would be a great career for her. Nevertheless, she was very reluctant about taking physics. On course selection night, she told me repeatedly that she felt she wasn’t intelligent enough. I tried to allay her fears, and I guess I was successful enough that she enrolled in my physics course. Over the first semester, she did okay — Bs and Cs, mostly. We talked again about her career plans at the end of the term, and she told me she’d decided she wasn’t intelligent enough for engineering, and that her middling grades were evidence of this. Although we talked many times after this, I was never able to change her mind. Irina needed some extra help in the first semester, to master some essential math and physics skills and build her self-efficacy, but I didn’t see that. In the future, I’m going to be more careful and more supportive with new students who have low self-belief and fixed mindset-style attitudes. This is especially relevant for girls and minority students, for whom self-efficacy already tends to be quite low. In an after-school robotics club, one student was explaining to two others his idea for using tank treads for the robot. He wasn’t doing a great job of explaining his idea, so I asked him to try again; he did, although with a bit of an exasperated tone. When he finished, I turned to the two students and asked them, “Did that make sense to you?” “Yes, I know what a tank is,” replied one. The two listeners went off to work on something else. Later, they told me that many of the other students weren’t taking their ideas seriously. They interpreted my question (and their peer’s explanation) as condescension, and that was sort of the last straw. I apologized and tried to explain, but by that point the damage had been done: I restored their trust in me, but not in the robotics club. They came to the next meeting, but interacted with almost no-one, and didn’t return after that. My microaggression against these two students happened because I briefly stopped focusing on their affective experience. For students in STEM, there are so many threats: my job as a teacher is to remove these and make a safe learning environment. Going forward, I’m trying to be more sensitive to the environment and careful about my own actions. A student in my math class, Joe’s academic record was weak. His academic language skills were particularly poor because, as our program coordinator explained it, he’d never developed a first language. Instead, he spoke French early in his life, then German with his mother and friends, and then English when he moved and found a new school and a new social circle. With Joe, I was insufficiently proactive. I didn’t insist on extra help after school, I didn’t establish strong communication with his mother early in the year, and I didn’t differentiate my instruction or get him alternative resources. By the time his weak grades started to pile up, he was too far behind to properly catch up and he had decided he couldn’t succeed in the course. These students all went to university, at least for one year. They’re pursuing their dreams and doing alright. I’m pursuing my dreams too: being a better teacher for my next class of students. This entry was posted in Uncategorized on April 7, 2018 by Danny. For a variety of reasons, I’ve been thinking a lot about open-ended tasks for assessment. 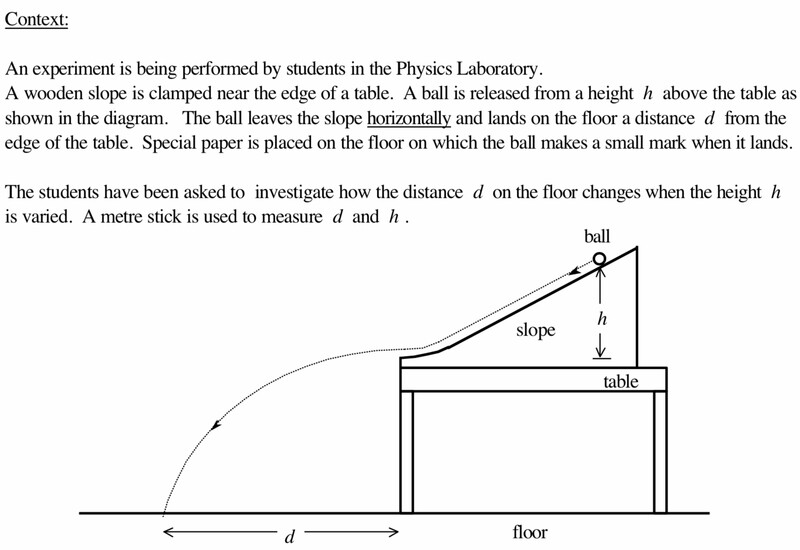 This style of physics “problem” gives the student the opportunity to use a variety of different approaches to demonstrate their understanding in a semi-authentic context. Below are the open-ended tasks from the Scottish Qualifications Authority physics exams 2014-2017 (ie: from the N5, Higher, and Advanced Higher exams). My primary purpose in posting these here is to provide a resource for students studying toward their SQA qualifications. * I think that answering this type of problem effectively requires careful practice, and I hope this collection is useful for that! First, here’s the detailed rubric. Each open-ended task is scored between 0 and 3 marks. And here are the prompts. A few have been excluded because they are built into the context of a longer problem. A bunch more are here. * I think this falls within the stated allowed use, but please write me if that is not the case! This entry was posted in Uncategorized on March 7, 2018 by Danny. Forbes published their “30 under 30” list for education. It’s a list notably lacking actual teachers. This is frustrating because, as exciting as it may be for these young people to create a start-up designed to help their communities, we already have a group of highly-trained, preposterously-dedicated people for whom teaching is a vocation. So, I’d like to present an alternative “30 under 30”: educators who are genuinely changing the world, and not getting the salary or respect they damned well deserve. (And I don’t care about their ages). Kristine Atrens – A top-notch kindergarten teacher who epitomizes dedication and caring. Peter Bohacek – One of the people behind Direct Measurement Videos and Pivot Interactives, both of which are really effective because of Peter’s ability to draw on his teaching experience to understand what active learning really requires. Stephen Collins – An expert on the Socratic method and standards-based grading, and a modeling instruction leader. Oyuntsetseg Durvuljin – The founder and spiritual leader of ‘Hobby’ School, a project that lifted hundreds of students into the upper-middle class through education and providing opportunities. Cristina and John Julius Fajardo – This teaching couple are the most enthusiastic, energetic, teachers I have ever met. They care about the students so much that the students can’t help but care about learning. Erdenetsetseg Gombojav – Such a great teacher that she becomes an extra parent and gets the best out of her students by caring for them and maintaining the highest standards. Chris Hamper – A lifelong physics teacher, textbook author, online resource provider, and workshop leader. The best of IB Physics comes from him. Megan Hayes-Golding – A superb physics and STEM educator with a passion for helping students take on challenges. Bonus points for bow ties. Richard Hechter – A scholar and educator who focuses on cultural aspects of science education, especially the intersection between Western and Canadian Aboriginal ways of knowing. Meghan Hennick – An innovative, creative, and passionate elementary school teacher on the international circuit. Scott Hovan – Probably the expert on how to get students talking honestly, thoughtfully, and considerately in high school physics. Sarah Johnson – An educator at Simon Fraser at the forefront of getting girls into physics, and changing the discipline to make it more accessible. Michael Lerner – A deeply passionate educator who puts his students first, and invests the time and energy needed to create an exceptional learning environment for them. Joe McIntyre – An educator and policy scholar with strong passion and a deep commitment to education as a tool for social empowerment. Zanda Medne – An English and German teacher and university lecturer who inspires love from her students by being passionate about their success. Dan Meyer – Former high school maths teacher, currently developing great tools at Desmos. Derek Muller – Best known as Veritasium, his Youtube channel is an outgrowth of his doctoral research into how students learn via videos. Kelly O’Shea – Proof that educational change happens best when it comes from working teachers. Her numerous ideas, shared through the blog, have helped hundreds of teachers move toward more active teaching methods. L Ozola – An excellent maths teacher and PhD student, she connects with students through humour and inspires them to do exceptional things. Moses Rifkin – A deeply wise and conscientious man at the forefront of social justice in high school physics education. Marianna Ruggerio – An enthusiastic and creative physics teacher who has recently started sharing her experiences via Twitter. Andy Rundquist – A physics professor with a commitment to faculty development, collaboration, and learning communities. Patrick Savage – A drama and French teacher whose compassion and patience for his students have always inspired them to become better citizens. Sloane Schubert – A thoughtful, original, caring educator with a broad range of experience and mastery. Leigh and Scott Simon – A teaching couple whose passion for their students is exceeded only by their willingness to do whatever it takes to provide meaningful, exciting, and effective learning experiences. Ieva Smits – A dedicated teacher with a strong commitment to education as a way to improve communities, especially through service. Evan Weinberg – Evidence, in case any is needed, that great teachers can build the tools they need to conduct great teaching. This entry was posted in Uncategorized on November 16, 2017 by Danny. The Times Education Supplement [TES] is known as a fairly conservative British publication, focusing on policy news, endorsements of the teaching profession, and op-eds by teachers. So it was surprising to see a click-bait headline relating to physics education research: “Taking the pee out of physics: How boys are getting a leg-up“. Unlike many submitted posts, this one is not identified as being written by a blogger, and comments are disabled — we are intended to treat this as real research news. The crux of the argument is this: we have a gender gap in physics scores on standardized assessments. That gap seems to be most pronounced on tasks involving 2-dimensional motion. One explanation for the discrepancy is that boys have more experience with balls, rockets, cannons, and so forth because of the social conditioning they experience as children. However, the authors note that female students in the “ultra-masculine environment” of a military school show the same gender gap. Thus, they conclude that ball sports and play-acting war isn’t the factor. Instead, they propose that boys playfully urinate, and thus have experience with projectile motion in a way that girls don’t. There is a lot about the article that is objectionable. 1. This article isn’t based on published scientific work, it doesn’t refer to a submitted manuscript, and the authors don’t have any related publications in the literature. This isn’t an idea that has been vetted by peer review. More importantly, it isn’t a mature scientific idea: the authors have proposed a hypothesis, but haven’t actually carried out the experiment. It would be easy to test: survey men about their childhood urination habits, and about their proficiency with physics. Maybe throw a tricky physics problem at them, too. But the authors didn’t do this, preferring to write about the idea as if it were too obvious to need verification. This sort of speculative science is problematic, and popularizing ideas that haven’t been vetted empirically has been problematic in physics in recent years. It is particularly bad in the field of physics education research, which is struggling to be recognized as proper science by a dubious physics community. 2. Since the authors didn’t conduct a study, I did. I asked 25 people (THANK YOU!!) to answer four questions: were they sports fans as children, did they playfully urinate as children, and were they good at physics in school? I also asked them which angle would optimize the range of a projectile in the real-world case where air friction cannot be neglected — someone familiar with projectile motion either experimentally or theoretically should know that slightly decreasing the angle from 45 degrees (the theoretical optimum) will increase the range when air friction is considered. The results of the survey show that neither urination nor sports were strong predictors for physics ability. The strongest relationship was between sports and success on the physics problem, but this did not reach an adequate level of confidence*. In short, had the authors actually tested their hypothesis, they would have found it incorrect. Unfortunately, with phrasing like that, the authors are not. 4. Another point is made by Brett Hall: projectile motion isn’t a topic that occurs at the start of the curriculum, yet the gender gap is apparent from early in the physics course. Likewise, the authors suggest focusing on energy conservation first, rather than projectile motion, but this is something that is already done in many classrooms. 5. Research by Zahra Hazari and others points to socio-cultural factors (identity, home and school support) being the most relevant to explain why girls opt out of physics. I wouldn’t argue that the gender gap is an understood problem, but the authors present it as wholly-unsolved (perhaps to increase the audience’s willingness to accept their unorthodox idea) when it isn’t. 6. [addition 18 September] On further reflection, it is more clear to me that the phrasing and positioning of this idea to be damaging and troublesome, in addition to being incorrect and click-bait. A phrase like “why don’t young women perform as well in physics?” presupposes that the cause is a deficiency in the women, rather than the sexist culture in which they are raised and on whose assessments they are being found wanting. I hope no teenage girl hears of this incorrect hypothesis, reads this article, or absorbs the various ripples it is making in the news media. Lastly, a note about ad hominem rebuttals. I think that most men would look at this idea and disagree because of their personal experience. I’ve seen some rejection of this hypothesis because the primary and secondary authors are female. However, there is value in the perspective of an outsider: we do a lot of things unconsciously, and only an external viewer would be able to make connections we might otherwise miss. Dismissing this work about male urination because the authors are female is incorrect. I think that’s about all I want to say about this idea. Hopefully we can forget it now. * The n=24 study I did was enough to show that the urination=physics ability hypothesis cannot be the primary explanation for the gender gap. However, it is possible that there is still a small correlation. As pointed out by Steve Zagieboylo, however, this pathway likely goes boy-sports-physics rather than boy-urination-physics, given the strong social differentiation that boys face. The results from my study suggest this but, since the effect is smaller, I cannot claim to have discovered anything with the small sample I used. This entry was posted in Uncategorized and tagged gender gap, physics, physics education research on September 17, 2017 by Danny.